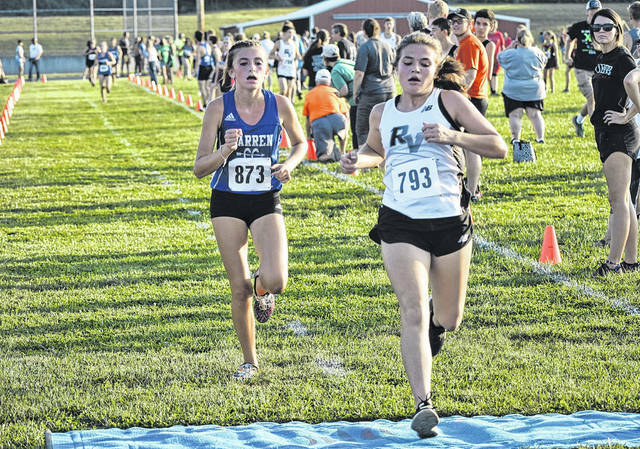 River Valley’s Lauren Twyman crosses the finish line at the Federal Hocking Invitational on Sep. 19 in Stewart, Ohio. MINFORD, Ohio — The River Valley cross country teams competed at 2018 Minford Invitational held Saturday on the campus of Minford High School with the girls and boys squads earning first and second place team finishes. A total of 11 teams and 96 varsity participants competed in the event, with Northwest coming away with the boys team title and River Valley capturing top team honors in the girls event. Both varsity races featured over 30 runners apiece, with 58 boys and 38 girls taking to the course in the separate competitions. River Valley posted a winning score of 36 points in the girls race, finishing 14 points ahead of runner-up South Webster (50). Lauren Twyman (23:03) led the way for the Lady Raiders with a third place finish, while Hannah Culpepper (23:59) followed with a fourth place effort. Kaylee Gillman (24:01) was next in fifth place, while Josie Jones (25:50) followed with a 14th place effort. Julia Nutter (26:27) and Connie Stewart (27:06) were next for the Silver and Black with 17th and 18th place finishes, respectively. Kate Nutter (28:45) closed out the top-seven finishers for RVHS with a 21st place effort. Pike Eastern’s Abigail Cochenour won the girls race with a time of 20:49, while Olivia Messer of South Webster was the runner-up with a time of 22:19. Evan Leist of Pike Eastern won the boys race with a time of 16:22, with Aiden Kammler of Portsmouth coming in second with a mark of 16:37. Dylan Fulks (18:15) paced the Silver and Black with an eighth place effort, while Rory Twyman (18:49) was next finishing 11th. Cody Wooten (19:08) followed for RVHS with an 15th place finish, while Caleb McKnight (20:15) was next with a 19th effort. Ian Eblin finished 20th with a mark of 20:30, while Chad Brewer (22:53) was next coming in at 37th overall. Nathan Young (22:56) followed with a 38th place effort to round out the top-seven finishers for the Raiders. Visit baumspage.com for complete results of the 2018 Minford Invitational.